The first chapter of Job is idyllic and unstained. It might as well open with a line like, “Once upon a time in a land far away, there was a king who had seven sons and three daughters, and all was right with the world.” This is the feeling you’re supposed to get because the book of Job symbolizes the story of the world from creation to fall all the way through the redemption and restoration. The opening verses are Edenic. The opening line says of Job, “that man was blameless and upright one who feared God and turned away from evil.” He’s perfect in an Eden garden. Others described as blameless are Noah, Jacob, and David. The same word is used for animals acceptable for sacrifice. Exodus and Leviticus say the animals must be perfect or without blemish, i.e., blameless. When we read the word blameless, we tend to think of sinless perfection. That makes us uncomfortable because we know that nobody but Jesus is like that. But a little study shows that the word isn’t talking about sinless perfection as much as it refers to integrity, honesty, and allegiance to the Lord. Job wasn’t perfect, but he was faithful. Not only is Job a faithful Adam, but he is a fruitful Adam who multiplied. “There were born to him seven sons and three daughters. He possessed 7,000 sheep, 3,000 camels, 500 yoke of oxen, and 500 female donkeys, and very many servants.” He has tended his garden very well. 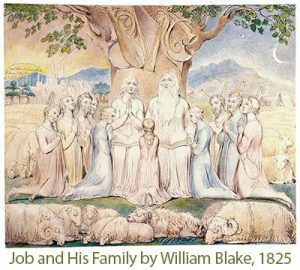 God created man in His image and gave a mandate: “Be fruitful and multiply and fill the earth and subdue it, and have dominion over the fish of the sea and over the birds of the heavens and over every living thing that moves on the earth.” Job has done that. He’s a faithful and fruitful Adam ruling over his kingdom. There is even numerical symbolism to highlight Job’s faithfulness and fruitfulness. The number 10 describes fullness in the bible (10 plagues, 10 donkeys from Joseph, 10’s in the tabernacle construction, 10 Commandments, 10 sons for Hannah, etc.). Job has 7 sons + 3 daughters, 7,000 sheep + 3,000 camels, 500 oxen + 500 donkeys. This is a good place to start. Job is wisdom literature and opens like Proverbs: fathers and sons living faithfully in the abundance and glory of wisdom. But, this is only the beginning of wisdom. There is a great deal more to come, and that will prepare and train the wise person to increase in glory. Job does that, as we shall see.